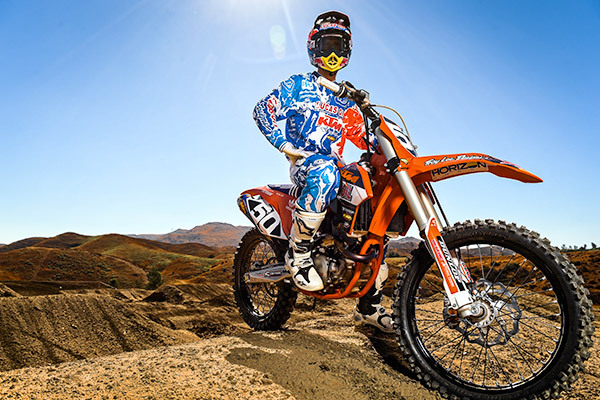 Troy Lee Designs (TLD) announces a multi-year deal with KTM Motorsports which will see the Troy Lee Designs / Lucas Oil / Red Bull / KTM team riders compete in both the 2015 AMA Supercross Series as well as the 2015 Lucas Oil Pro Motocross Championship aboard Red Bull / KTM supported motorcycles. Structured as a multi-year alliance, the cooperative effort will include both the factory supported Troy Lee Designs / Lucas Oil / Red Bull / KTM race team in addition to creating a newly defined infrastructure that will partner the successful KTM initiated Orange Brigade amateur program into the TLD operation. The mission of the initiative will be to create a world class structure which will bring talented young motocross racers into the KTM program, and in doing so, provide them with all of the technical assistance and professional guidance needed to help them achieve their goals in the sport, be they amateur national titles or AMA Pro Racing Number One plates. Added Jon-Erik Burleson, President of KTM North America, of the comprehensive TLD amateur and professional racing cooperative: "For the past four years we have been building a program to start with our Orange Brigade kids at an early stage and bring them all the way through our program to the professional level. By adding the TLD program, we can finally say all of the core components are there. They have a proven 250 program and a keen interest in farming from our already strong amateur program. Add to that the amazingly creative brand of Troy Lee Designs and we not only get a racing program, but a great collaboration of our two brands that will be really exciting to see develop over the next few years." Furthermore, the new partnership between Troy Lee Designs and Red Bull / KTM will see the world famous TLD design firm and paint shop collaborating on a spectrum of new and innovative projects and products which will blend the style and creativity TLD is globally recognized for, with the world class, competition-proven racing equipment design, built and refined by KTM. For over 30 years, Troy Lee has been customizing helmets "For The World's Fastest Racers." TLD's relentless commitment to creating products that exceed the cutting edge of style, design and quality, has earned them the reputation as an innovator in many different fields of racing. 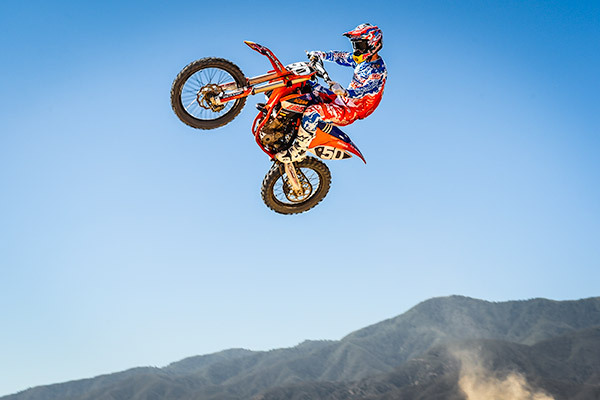 Troy Lee Designs has since expanded into a full force operation, offering a complete line of helmets, apparel and premium protection for off-road motorcycling and bicycling, sportswear and accessories, and operating the TLD supercross and motocross teams. Based in Corona, California, Troy Lee Designs has a global network of distributors. 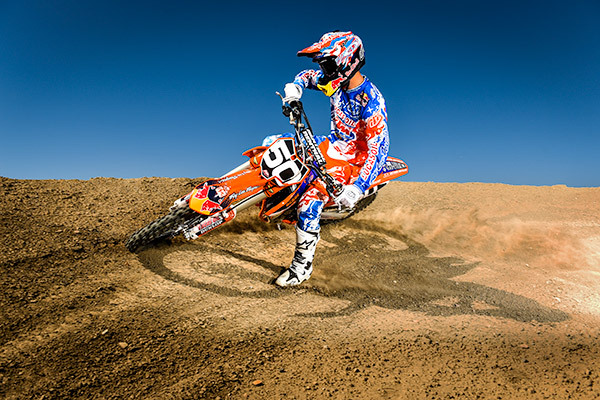 "READY TO RACE" – for KTM, these three words are far more than a simple slogan. They stand for the entire company philosophy of developing vehicles that can without any modifications comprehensively assert themselves in any race. Direct from the dealer onto the track and into the battle for victory. Designers, engineers and riders are bound by a clear common denominator: an unconditional passion for motorcycles. The whole KTM family is a living example of this worldwide. Countless offroad World and European championship titles plus brilliant victories in the world's toughest races (International Six Days Enduro, Dakar Rally, Erzbergrodeo, and many more) all speak for themselves. And KTM Supermotos, Naked Bikes, Superbikes and the X-Bow all demonstrate what an "orange" lead means on asphalt.